While laptops are preferred, netbooks, iPads, tablets, and smartphones are acceptable as well, so choose the device that works best for you. If you don't have a device available, your teacher may loan you a school-owned device for the duration of the class, or you may work with a group. 2. Access to the School's wireless BYOD network. A special network for BYOD is accessible at school. Our Wi-Fi Network is WAKE-BYOD. 3. Access to your WCPSS Google account which includes Google Drive to store documents. WCPSS emails, Google accounts, and access to Google Apps for Education are provided by the county for every student. 4. A bag, sleeve, or cover to protect the device. Please remember you are responsible for your device while using it on school campus. ​5. A signed HHS BYOD Agreement on file. 1. BYOD is a privilege, not a right. 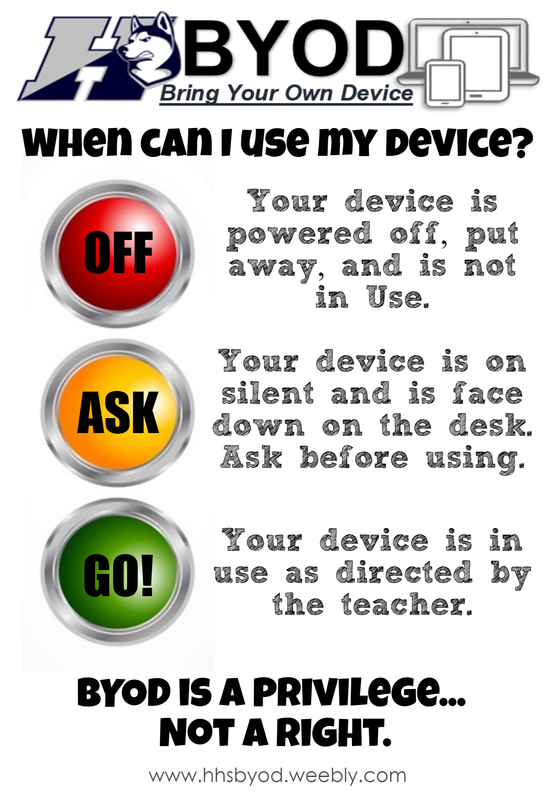 If you can not follow BYOD Guidelines, teachers will ask for your device for the class period and refusal to do will cause disciplinary action. 2. It's okay to bring your laptop to school. Working on your laptop might be easier to manage then typing on a small, hard to see smartphone or tablet screen. Its totally cool for you to bring in that laptop. 3. I should express my style with my Personal Device. It's okay to have stickers and decals on your Personal Device but make sure that they are not offensive and promote intolerance. By labeling your Personal Device you are able to easily identify your device from others.